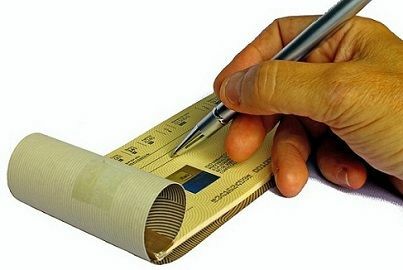 ‘Cheque‘ is an instrument which contains an unconditional order, drawn on a banker, directing to pay a certain sum of money to the person whose name is specified in the instrument. 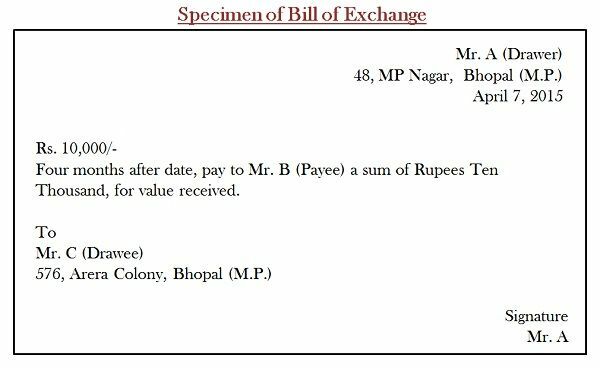 In contrast, ‘Bill of Exchange‘ is a document contains an unconditional order, directing a person, to pay a certain amount to a specified person. A negotiable instrument is a written document, which entitles a certain amount and is transferable from one person to another, by simple delivery or by endorsement and delivery. There are three types of a negotiable instrument as per statute, i.e. cheque, bills of exchange and promissory note. There are many instances when people juxtapose cheque for a bill of exchange, but they are different, in the sense that a bill of exchange requires acceptance, whereas there is no need for acceptance in cheque. Go through with this article to learn some more differences between cheque and bill of exchange. Meaning A document used to make easy payments on demand and can be transferred through hand delivery is known as cheque. A written document that shows the indebtedness of the debtor towards the creditor. Grace Days Not Applicable, as it is always payable at the time of presentment. 3 days of grace are allowed. Acceptance A cheque does not require acceptance. Bill of exchange needs to be accepted. Stamping No such requirement. Must be stamped. Noting or Protesting If the cheque is dishonoured it cannot be noted or protested If a bill of exchange is dishonoured it can be noted or protested. A cheque is a type of bill of exchange, used for the purpose of making payment to any person. It is an unconditional order, addressing the drawee to make payment on behalf the drawer, a certain sum of money to the payee. A cheque is always payable on demand, i.e. the amount is paid to the bearer of the instrument at the time of presentment of the cheque. It is always in writing and signed by the drawer of the instrument. Drawer: The maker or issuer of the cheque. Drawee: The bank, which makes payment of the cheque. Payee: The person who gets the payment of the cheque or whose name is mentioned on the cheque. Electronic Cheque: A cheque in electronic form is known as an electronic cheque. Truncated Cheque: A cheque in paper form is known as truncated cheque. A bill of exchange is a negotiable instrument, contains an unconditional order, directing the drawee to pay a certain sum of money to payee addressed in the instrument. The bill is made and signed by the drawer and accepted by the drawee. It contains a pre-determined date on which the payment is to be made to the payee. It can be payable on demand when the bill is discounted with the bank. The parties to the bill of exchange must be certain. Drawer: The maker of the bill of exchange. Drawee: A person on whom the bill is drawn, i.e., the person who gives acceptance to make payment to the payee. Payee: The person who gets the payment. An instrument used to make payments, that can be just transferred by hand delivery is known as the cheque. An acknowledgment prepared by the creditor to show the indebtedness of the debtor who accepts it for payment is known as a bill of exchange. The drawer and payee are always different in the case of a cheque. In general, drawer and payee are the same persons in the case of a bill of exchange. The stamp is not required in cheque. Conversely, a bill of exchange must be stamped. A cheque is payable to the bearer on demand. As opposed to the bill of exchange, it cannot be made payable to the bearer on demand. The cheque can be crossed, but a Bill of Exchange cannot be crossed. There is no days of grace allowed in cheque, as the amount is paid at the time of presentment of the cheque. Three days of grace are allowed in the bill of exchange. A cheque does not need acceptance whereas a bill needs to be accepted by the drawee. Addressing the drawee to make payment. Signed by the drawer of the instrument. Express order to pay a certain amount. Cheque and Bill of Exchange both are used to make payments easily. However, the cheque itself is a type of bill of exchange, used to discharge the liabilities and so it consists of all the features of a bill of exchange. Not only in business, but individuals, government agencies, and other institutions also use the cheque to make payments but the bill of exchange is mostly used in business. This was a very useful article. I understood the difference between cheque and bill of exchange. But, there is one thing I dont understand which is #4 of key differences. drawer and payee are same persons in case of bill of exchange? Can you correct me if I’m wrong. I’d appreciate your amazing article again. You can see in the definition of cheque and bill of exchange about the parties and clarify the doubts. The drawer of the bill of exchange is the one who makes the bill instructing the drawee to pay the amount to payee. The payee can be the drawer himself or some other person indicated by the drawer on the bill. And as you said drawee and payee cannot be the same person, because the drawee is someone who pays the amount and payee is the person who receives the amount, and if both are same, then there would be no need of drawing bill on himself. I hope you understand the answer. Thank you, Mam for this information.Friday I have an exam about this. Thanks for helping. What is the contractual relations between the bank and the parties in a crossed cheque?